We're back. Actually we've been back for nearly a week, but after forty hours in transit and ten hours of time zone change it has taken this long for me to get back to the point where I feel like I can write even semi-coherently (to say nothing of digging through six weeks of accumulated mail and whatnot). Our trip home started the morning of November 30th with a drive to a little dirt airstrip in the middle of nowhere where we were picked up in a little ten-seat airplane. 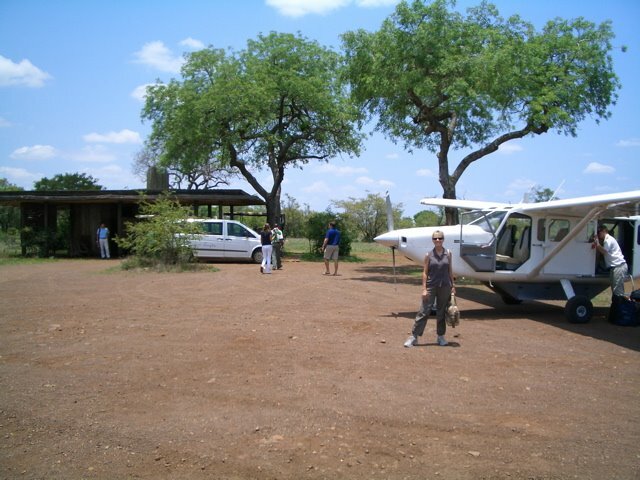 This plane was going to take us to the Kruger International Airport in Nelspruit, about 45 minutes away. There we would have a one-hour layover before catching a jet back to Cape Town. It was about 11:00 in the morning and already nearly 100 degrees. Not even an hour into our little odyssey and we were already hot and sweaty. The plane was about twenty minutes late, eating up most of our layover margin. On top of that, we learned that we had to make another stop to pick up more passengers. The second stop was another nondescript dirt strip in the middle of nowhere. We loaded on two more people and their bags. They were going to catch the same flight we were, so everyone was feeling a little tense about the schedule. Everyone piled in and we taxied for takeoff. Now, this is about a 3000 foot long dirt strip, and there's a fairly stiff wind. We had landed upwind, and the pickup point was at the upwind end of the strip. So the normal procedure would have been to taxi back to the downwind end of the runway, turn around, and take off into the wind. But the pilot, aware of the schedule pressure, just jammed the throttle and took off. Now, I figured that this guy does this for a living and he knows what he's doing. Besides, his life is at risk along with ours. But this airplane is no great performer. It's a workhorse. And it's pretty heavily loaded at this point. And it's hot, which makes the air thinner. And we have a tailwind. And there are trees at the end of the runway. Images from this video popped into my head. I guess the fact that I'm writing this eliminates some of the suspense, but I have to tell you I was getting very, very nervous. I was watching the airspeed gauge creep up veeeerrryyy slooooowwwwllllyyyy and watching the end of the runway approach. About two thirds of the way down I knew that we'd reached the point of no return. We were going too fast to stop before we reached the end, but still too slow to actually take off. If the engine had failed -- or even faltered -- at that point we'd probably be dead. We cleared the trees with probably twenty feet to spare. We landed at Nelspruit just ahead of the jet that was going to take us to Cape Town. To make a long story short, the flight was delayed by about an hour, so all our rushing was for nothing. The airport wasn't air conditioned, so by the time we got to Cape Town we were completely gross, and still facing an eleven-hour flight to London, and then another eleven-hour flight to LA. Fortunately, we were able to access some shower facilities at the airport. If not for that, I probably would have gotten no sleep at all on the flights and I'd probably still be recovering. That nail-biter of a takeoff was actually the third bullet we dodged on this trip, the first being in Mumbai just a few weeks before the Taj Mahal Hotel was attacked. It turned out (we found out after the fact) that we were also just a few hundred miles from the Sirius Star when she was taken by Somali pirates. It's an interesting part of the world, but I'm happy to be home.